Polaroid's Mint Camera & Printer is a fun instant camera if you love to take selfies! These days, selfies are the norm. We all love to take selfies when it comes to capturing fun times with others, meeting a celebrity or idol, or just when you're in a new locale and want to capture the memory of you being there. We all have smartphones with powerful cameras for all of our selfie-capturing needs, but what if we want those moments instantly printed? That's right, Polaroid is bringing instant prints back to your selfies, or whatever else you want to capture in the moment. 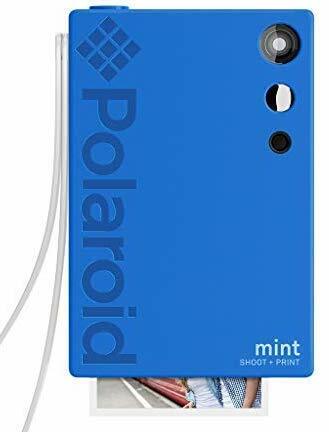 Bottom line: Polaroid Mint Camera & Printer is a fun instant camera that's perfect for capturing selfies in portrait orientation and printing them out instantly. However, if you want an all-purpose digital camera with the capability of printing, then you may want to look elsewhere. Honestly, I'm not too much of a selfie person. When I say this, I mean I don't really take a selfie every day and post it on my social media. However, I do enjoy taking selfies when I am hanging out with friends and experiencing new things, or just in a new locale. I also grew up during the time when printing out photos was "the thing" to do, which is why I enjoy seeing this comeback of instant cameras lately. My favorite thing about the Polaroid Mint Camera & Printer is the size. It's almost as wide as my iPhone XS, but just a tad shorter, and is about as thick as two iPhones in non-bulky cases. This means that the Polaroid Mint Camera fits in my back pocket easily, so I can take it with me anywhere. It also comes with a clear plastic wrist strap that you just push into a hole to install, so it's easy to install and fairly secure. Before you start taking pictures, you'll want to make sure that the ZINK "Zero Ink" paper is loaded. Getting paper in is pretty easy - just open the back of the camera from the latch, insert the paper in (glossy side up) and then close the door. It's easy, and each pack has a calibration sheet that makes it easy to remember how to install (calibration sheet always on the bottom). The nice thing about the Polaroid Mint Camera is that it's fully rechargeable, so you don't need to worry about batteries. It can print up to 40 photos on a single charge too, so it does last a while. To turn it on, all you need to do is press down on the power button for a few seconds until the light comes on. The Polaroid Mint Camera is easy-to-use and perfect for the selfie-loving scrapbooker thanks to the convenient and sticky-backed ZINK paper it uses. I've found the Polaroid Mint Camera pretty easy to use, especially for selfies. Since it's vertically-oriented, holding it feels just like a smartphone, so there's no learning curve. The selfie mirror on the front is small, but you can definitely see yourself and frame your photo accordingly. If you don't want to use it vertically, that's fine too! Just hold it like a normal camera. A viewfinder window is located on the back and has a transparent frame to help you line up what is in the shot and gets printed out. With the Polaroid Mint Camera, you're able to shoot in three color modes: Color, B&W, and Sepia. To change, you'll need to hold down the "Mode" button to cycle through the three choices in that order (it beeps each time). If you want to add the classic Polaroid frame to your print, hold down the "Frame" button until it beeps. Your printed photo will resemble the classic square Polaroid instant prints from the past. It's great when you want to add captions or dates to your photos. The 10-second timer gets activated or deactivated with a push. When it's on, you'll have 10 seconds after pushing the shutter button to get the perfect pose. The light ring around the flash will indicate when the picture is about to be taken. If you try to use the Polaroid Mint Camera in low-light situations, it's able to detect that. The LED flash will automatically go off thanks to a light sensor, so you won't have to worry about a bad selfie. And since the camera itself is 16-megapixels, the quality itself isn't too shabby. The fact that the Polaroid Mint Camera & Printer uses ZINK paper is also a bonus. That means I don't need to worry about replacing ink or toner in the camera when I want to capture and print. All I need to worry about is making sure I'm loaded up on ZINK paper. The ZINK paper is even sticky-backed so you can peel and stick them wherever, making scrapbooking activities super easy. Optionally, the Polaroid Mint Camera can use a microSD card, which is inserted into a slot on the side of the camera. Using a microSD is optional, but you'll be able to save digital copies of your captures on the card. This is especially useful when you run out of paper, because digital copies are saved automatically. The thing that I love about digital photography is the fact that you can take as many pictures as you want, since space is plentiful. However, with an instant camera like the Polaroid Mint, each shot that you print out costs money, so you'll want to be more cautious about your shots, as it's a shame to waste the paper. I was also surprised that you only get a measly five sheets of ZINK paper with the initial purchase. I feel that's far from enough, and you should get double that to start with. Plus, the camera won't tell you when there's no paper inside, which is counter-intuitive, considering that there's a power light. I would also like to use the Polaroid Mint Camera as a full-on digital camera, but it's definitely not made for that. You have no controls for focusing or adjusting the amount of light, and the flash is toggled automatically with no manual option. The biggest gripe I have with the Polaroid Mint Camera & Printer is the fact that you can only print out new captures. Even if you use a microSD card and don't have any paper loaded, you're unable to go back and print any photos you take out even after loading paper, and even though you took them with the Mint camera. I was also expecting some kind of connectivity with my iPhone to print out existing pictures, so I was disappointed on that front as well. If you are looking to print out photos from your smartphone, then we recommend checking out the Polaroid Zip or Polaroid Mint Pocket Printer. If you love to take selfies anytime, anywhere, and want instant gratification when it comes to having them printed out, then the Polaroid Mint Camera & Printer is made for you. However, if you want an instant camera that can also replace your digital camera, then this isn't that. The lack of smartphone connectivity is also a big disappointment for me, as I was kind of expecting an all-in-one solution. Plus not being able to print out photos that you took that get saved onto the microSD card when you're out of paper is a bummer.